Originating from the Mediterranean region and Asia, the dwarf pomegranate (Punica granatum) is a subtropical deciduous tree that usually grows to only 2 feet tall and wide, but can still produce edible pomegranate fruits. 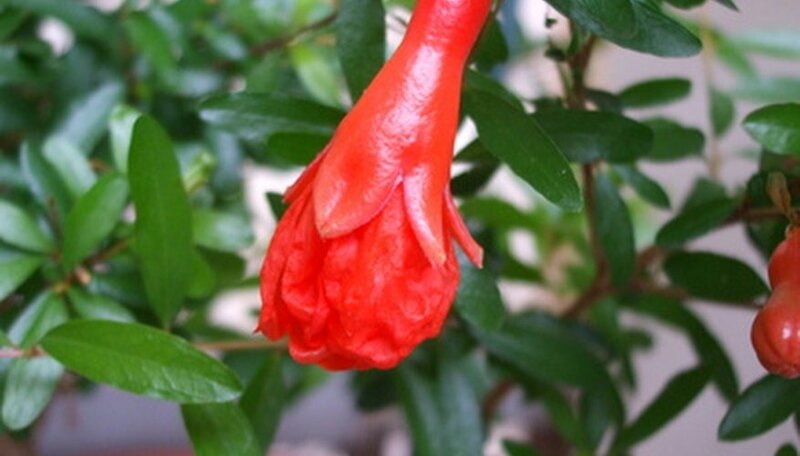 Often used for bonsai cultivation, the dwarf pomegranate blooms in coral-red, funnel-shaped flowers, followed by yellow to red fruits with smooth, leathery rinds and seedy, pulpy interiors. The dwarf pomegranate has an attractive, twisting trunk and glossy leaves. The dwarf pomegranate’s compact size makes it an excellent potted fruit tree for the home garden or indoors. Position your dwarf pomegranate trees in full sunlight throughout the growing season. You can keep the dwarf pomegranate outdoors in a sunny spot during the warmer spring, summer and early autumn months. Water your dwarf pomegranate to thoroughly moisten the potting soil once every week during the growing season. Allow the soil to dry out slightly before watering the pomegranate tree. Feed your dwarf pomegranate trees once every two weeks from spring until fall with a low-nitrogen, high-potassium, high-phosphorous liquid fertilizer, such as a 5-10-10 or 5-20-20 NPK (Nitrogen-Phosphorous-Potassium) fertilizer. Follow the dosage instructions on the fertilizer package. Prune your dwarf pomegranate’s stems back to about two sets of leaves and remove any crowded, dead, damaged or diseased growth. Do your pruning after the pomegranate is finished blooming and fruiting to prevent cutting away healthy flower buds. Bring the dwarf pomegranate tree indoors in the fall as soon as temperatures begin to drop down to 40 to 45 degrees. Set the pomegranate tree in a bright windowsill and stop fertilizing it until spring. Repot your dwarf pomegranate into a larger container once every two years in the spring, right when the buds begin to emerge. Pot your dwarf pomegranate tree in free-draining, lightweight potting soil. Don't expose your dwarf pomegranate tree to temperatures colder than 40 degrees, because this tree is very cold-tender.